Where to Buy Talon-G Rodenticide Bait Pack Mini Pellets, Talon-G Mini-Pellets Rodenticide - 300 x 25 grams - $122.95 for Sale with Fast Free Shipping! Talon-G Mini-Pellets Rodenticide - 300 x 25 grams is scientifically proven to deliver the fastest knockdown. This unique mini-pellet formulation is preferred by PMP’s everywhere for its high acceptance, superior efficacy and broad use label. 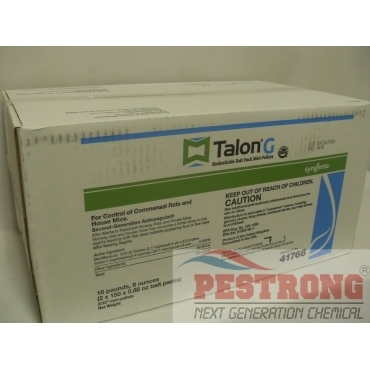 Talon-G Mini-Pellets Rodenticide - 300 x 25 grams is scientifically proven to deliver the fastest knockdown. This unique mini-pellet formulation is preferred by PMP’s everywhere for its high acceptance, superior efficacy and broad use label. Talon-G only requires a low dosage of the anticoagulant brodificoum, which often eliminates the common problem of bait shyness. I had rat problem at work, I tried few other rat poison but rats just won't eat them, and so I tried this product(it said it has high acceptance), and believe it or not the same rats rejected the other poison actually took this bait and I was able to get rid of them! We are a moving and storage company and we have never had a problem with rodents because of this product. We like the pacs because you can easily see if something has been getting into them.